Keeper Blog: The Butterflies are coming!! Blooming Butterflies is new to Como Park Zoo and Conservatory this year. This exhibit will open June 6, 2008. 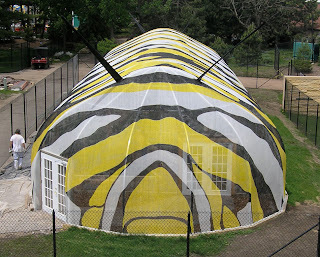 Hundreds of butterflies will be housed in this caterpillar shaped building. This week gardeners are finishing up planting and are preparing for the opening. Different butterflies found around the world will be showcased through out the season.